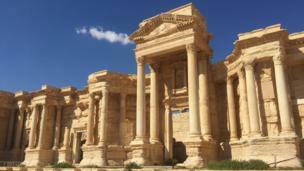 BBC Arabic photographer Wissam Abdo was among the first foreign journalists to enter Palmyra, the ancient Syrian city recaptured from so-called Islamic State by government forces. 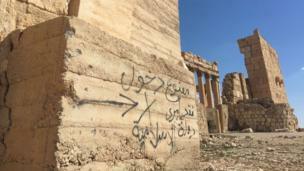 He found much of the site intact despite the well-publicised destruction of some monuments by the jihadists. The Theatre of Palmyra, where IS reportedly carried out a number of mass executions. In May 2015, residents of the city were rounded up at the theatre and forced to watch as 20 men were shot. There were fears that IS would destroy the majority of the city's historic ruins but images show that many of the most important structures, including the theatre, remain standing. 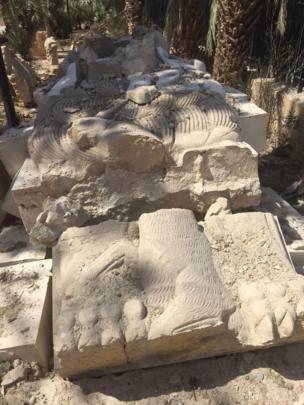 The Bel Temple, the ancient city's main temple and one of its most famous artefacts, was among ancient monuments reduced to rubble by the jihadists. 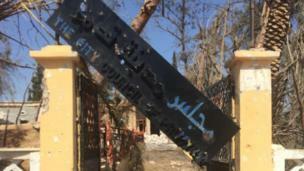 Graffiti on the gate of the Bel Temple reads: "Entry allowed only with permission from Islamic State." IS militants beheaded 82-year-old Khaled al-Asaad, a renowned archaeologist and the head of antiquities for the ancient city, after he reportedly refused to reveal the location of artefacts which had been moved. A sign for the city council of Palmyra sits askew. IS captured Palmyra after months of fighting with government forces. 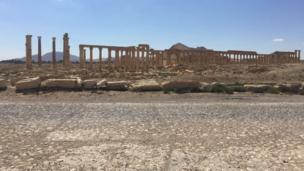 Syrian antiquities officials and experts from UNESCO are now assessing the damage at the site. 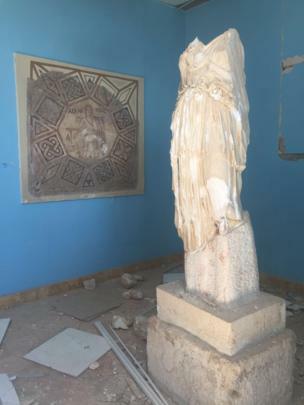 IS damaged or destroyed a number of historic works of art, including this statue of a goddess and a 2,000-year-old statue of a lion, both at the city's museum. Most of the pieces in the city’s museum were evacuated by antiquities staff before IS arrived. Most of the main colonnade in ancient Palmyra remains intact, images show, although parts were damaged during the IS occupation. 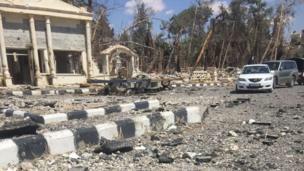 “What surprised us was that the damage was not worse," said Amr al-Azm, a former Syrian antiquities chief. 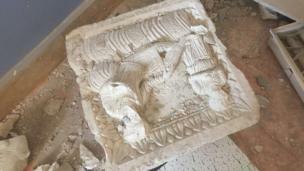 A damaged artefact from the museum of Palmyra. 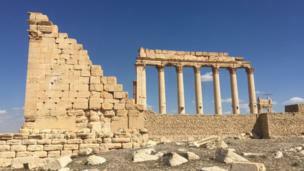 Maamoun Abdulkarim, head of antiquities in Syria, told the BBC that more than 80% of the ancient city was still intact. He said restoration and some reconstruction would be required but "in general we are very happy because I thought that the result would be more disaster". Damage in the city's main square. 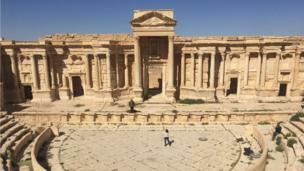 Syrian antiquities officials will hold a meeting with Unesco chiefs in Paris soon to discuss a strategy for the restoring the ancient city. Why does IS destroy monuments?